Das Attitude von 1996 in der Teamfarbe, von Gabriel Perard aus Frankreich ! Er hatte vor diesem Bike ein Attitude in der Teamfarbe, Grün, Weiß, Pink. Er hat es nach 10jähriger starker Benutzung verkauft. Dieses Bike hat er bei ebay.uk gekauft. Lest was er dazu geschrieben hat ! ....."I discovered your web site a few month ago while I was looking to purchase a new KLEIN Attitude. I am French, that´s why I am writing you in english (my German is not good enough!). 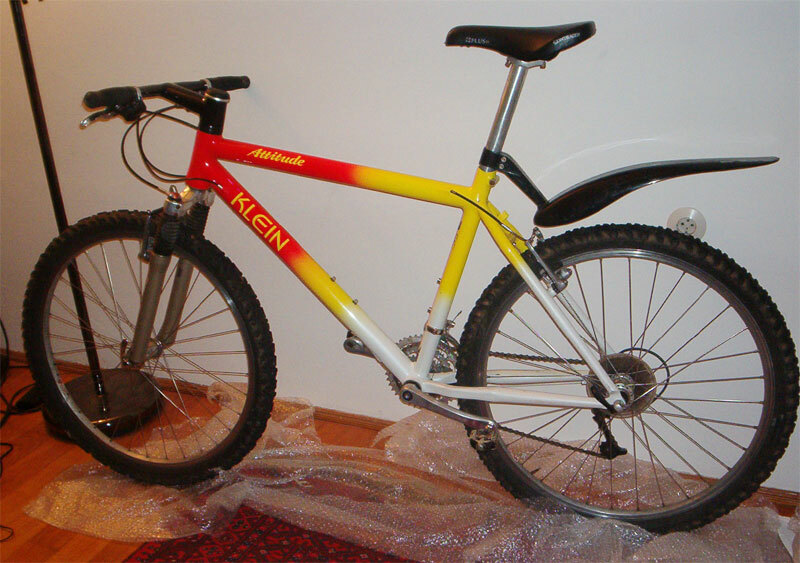 I have been a KLEIN fan for many many years, in fact since I have been riding in the early 90´s. My parents bought me in 1994 for my 15th birthday a second hand KLEIN Attitude in team USA livery (a 1991 model, green/white/pink). At that time the bike costed me 750euros and was in mint conditions because the frame just came back from the US (changed under warranty). I ride many kilometers on this bike for nearly 10 years, of course I had to change almost every parts, the only thing which remain original was the rear derailleur! This small deore XT derailleur was bullet proof ! Earlier this year I decided to buy a new KLEIN, mine was getting too tired, the bottom bracket and steering bearing needed to be changed as well as lots of other stuff. Most important the frame was a little bit bend after a big crash. So I sold my 1991 Attitude I start looking for a new one. I have many regrets having sold my old bike, especially for 100euros !!! How stupid I was that day, I should have keept it in my garage ! Anyway two month ago I found a 1996 model also in team USA painting for sale on ebay.co.uk. i made a good bid, and it´s now mine. Best regards and congratulations for your website and your bikes.....Gabriel".